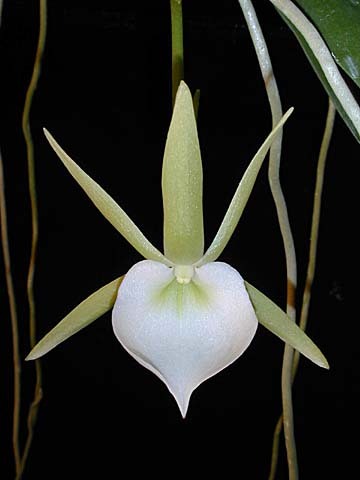 Angraecum birrimense Rolfe 1914 SECTION Arachnangraecum Schlechter Photo courtesy of Andy's Orchids Copyright © 2002 All rights reserved. Found in Ghana, Ivory Coast, Liberia, Nigeria, Sierra Leone, Cameroon and Zimbabwe in evergreen forests as a large to giant sized, hot growing epiphyte at elevations around 50 meters with elongated stems carrying distichous, oblong-lanceolate, unequally and obtusely bilobed, apically leaves that blooms in the summer and fall on a one to three flowered inflorescence with large, fragrant flowers. 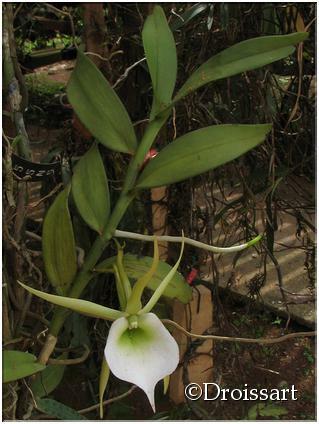 Best grown in a pot with a bark mix and a tree fern pole in the middle to which the elongated [to 6'] stem is tied until the roots form, given shade, humidity and hot to cool temperatures.